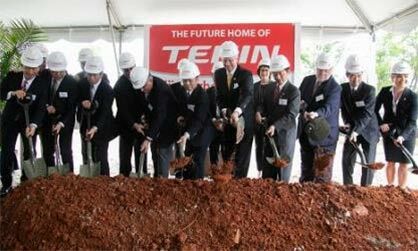 Teijin Limited announced today that it celebrated the groundbreaking of a new carbon-fiber production facility of its wholly owned subsidiary Teijin Carbon Fibers, Inc. (TCF). The ceremony was held on June 1 at TCF site in Greenwood, South Carolina. Teijin, aiming to be an enterprise that supports the society of the future, will further evolve its carbon-fiber businesses under a long-term vision to reduce environmental footprint to satisfy tightening environmental regulations worldwide. "South Carolina continues to make great strides in the manufacturing industry, and Teijin's expansion and commitment to our state is proof that our hard work is paying off," said Bobby Hitt, Secretary of Commerce, South Carolina. "We treasure our relationship with Teijin and look forward to industry success for years to come." The TCF facility is expected to create some 220 jobs with USD 600 million worth of investment around 2030. This is the largest initial capital investment that a company has ever created in Greenwood.